During my childhood, I went through a phase when I wanted to be an archaeologist. After all, Indiana Jones made it look like such a grand adventure, and I thought it would be pretty awesome to run around using a whip to swing across chasms while uncovering hidden treasures in exotic places. And if I couldn’t be the next Indiana Jones, I at least wanted to be a Goonie, and I always kept my eye out for any old maps or clues that might guide me in the right direction. I never imagined that spending these last few days cleaning out Grandma’s house might end up being just the treasure quest I spent so many of my childhood days dreaming about. But instead of the “rich stuff” that the Goonies were after, we have managed to unearth quite an assortment of odd and incredible treasures. Of course, you already know about the pantyhose and the six pack rings that Grandma apparently collected for her craft projects, but just wait until you get a glimpse of some of the goodies we found today. 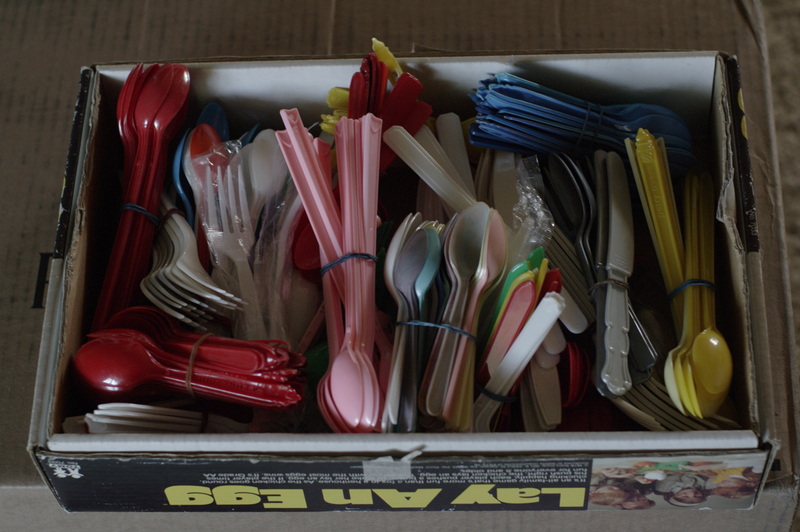 That’s right, assorted plastic utensils. Strangely enough, this little collection is only the tip of the iceberg. When we first started clearing out kitchen cupboards and drawers, we found three times as many. Apparently Grandma saved every plastic fork, spoon, and knife she ever ate off of, and then carefully sorted them by color and size to tuck away. We have yet to find any craft projects involving plastic utensils, so I can only guess that she was reusing and recycling them. Sadly, the Lay An Egg game is still MIA, but we still have a few boxes and closets to empty, so I’m not losing hope just yet. 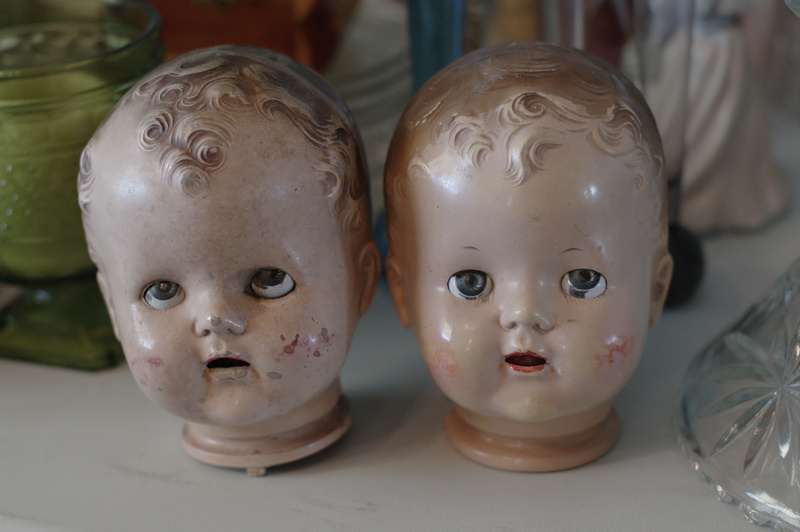 All I can really say about these is that my cousin Forrest and I agree that they are quite possibly the freakiest things we have found in Grandma’s house so far, and we really hope that someone buys them at the estate sale and takes them far, far away from here. I’m pretty sure I saw something similar once in a horror movie and while I don’t remember the plot, I’m pretty sure it didn’t end well. And last, but certainly not least, my absolute favorite discoveries in Grandma’s house so far have been the letters. Of course you might suspect that the writer in me would have an affinity for the old handwritten letters that Grandma tucked away. With all of her saving and collecting, I am just glad that she held onto them, and that we were lucky enough to find them. 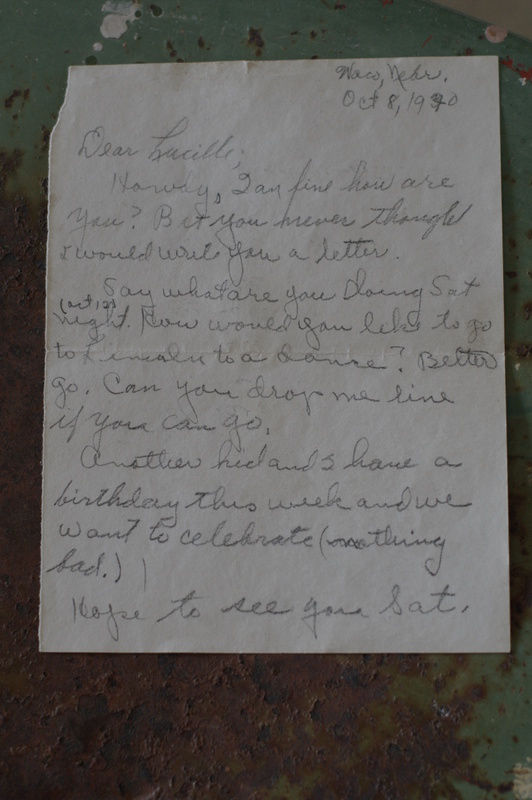 We think that this just might be Grandpa asking Grandma out on their very first date. 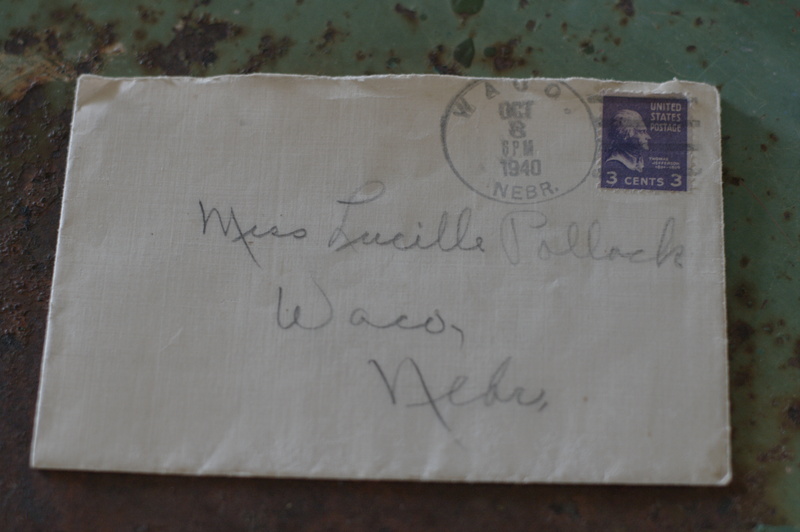 Definitely one of the best discoveries in the house so far, and luckily the letter is now safely tucked away with the rest of Grandma’s letters where it belongs. 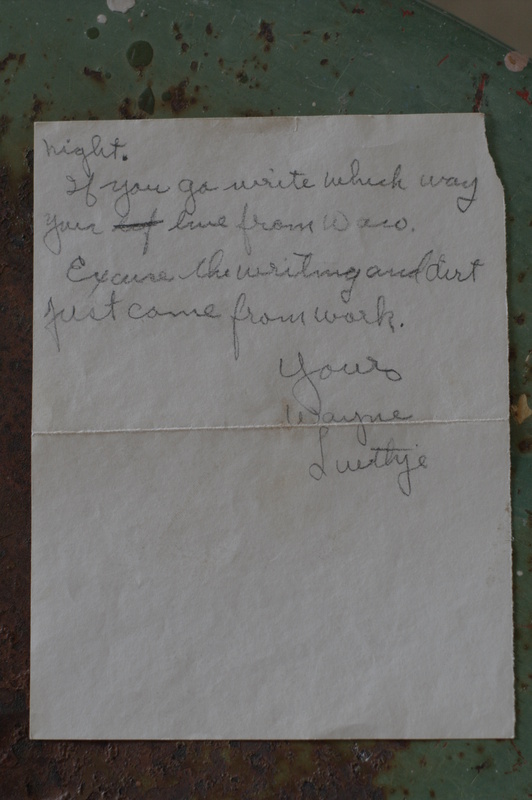 Today’s 365 Project entry is dedicated to my Grandpa Wayne, and getting the chance to see a whole different (mushy) side of him, and to my Grandma Lucille for all the history she saved for us. So, maybe I don’t have a whip or a treasure map, but I have to say, I’m pretty satisfied with the course of my current adventure. I’m just looking forward to seeing what tomorrow brings.